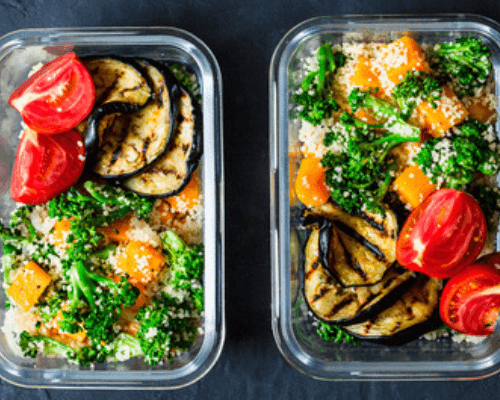 Meal prep your way to weight loss with these 12 clean eating recipes and tips to help you create healthy lunches and dinner ahead so you can save money, time, and sanity all while reaching your fitness goals! This post may contain affiliate links. For more information please visit my disclosure page here! Nothing will derail your diet faster than being hungry and having absolutely nothing prepared! Arm yourself with these twelve easy clean eating recipes and tips to keep your diet on track! Sometimes it feels like eating healthy and clean takes too much effort and is too expensive, but with a little planning and weekend meal prep, it’s not all that difficult or hard on your wallet! Take a few minutes on Sunday or Monday to choose your recipes for the week and get the grocery shopping out the way. Make it easy on yourself by selecting recipes that you can eat more than once, or that you know you can use for multiple meals. Chose recipes with vegetables that are in season. Save them to a Pinterest board or screenshot your favorites-whatever works best for you. Just find a system! Often you can buy in bulk and save money. Produce can be costly, but it does go on sale-watch for ads! Wash and chop all of your fruits and vegetables for the week the moment you get home from the store. Don’t put it off! If you hate this chore or you’d like to save a little cash frozen fruits and veggies will work just fine! They are picked when fresh and full of vitamins and nutrients! Cook a bunch of brown rice, whole wheat pasta, sweet potatoes, and quinoa on Sunday for the week’s lunch and dinner meals. These are healthy starches that will last up to 4-5 days in the fridge. Do this, and you’ll be ahead of the game! Plus you’ll always have something to eat in case you get hungry and tempted to drive through McDonald’s! Batch cook chicken and vegetables in the oven to save time later. Chicken can be used in all sorts of recipes from salads to soups! This is a huge time-saver! Stock up on shredded chicken by using this super easy crockpot recipe! Just take 4-6 boneless chicken breasts and add 1/2 cup water or chicken broth for every pound of chicken. Put everything in the slow cooker for 5 hours on low or 3 hours on high. Make sure you shred the chicken while it’s warm! Portion it out into 2 cup portions in an airtight container. (Most recipes call for this amount.) It’s ok for the fridge for four days or 4 months in the freezer. Make your snacks ahead of time and portion them out! It’s easy to go crazy grazing! Keep a few baggies or containers in your car or at work so you’ll be prepared when hunger hits! Don’t get the cheap ones! You’ll be sorry when you have to play the “Where’s That Lid” game later! Make it easy on yourself by using perfectly portioned reusable meal prep containers. If you prefer glass I’d go with this Glasslock set. For a great plastic option, these are fab & freezer, microwave, and dishwasher safe meal prep containers! Or slow cooker. Whatever name you prefer or model you choose! If you don’t have one you do need to get one-ASAP! Nothing beats a healthy meal that the crockpot simmered to perfection! Ready to cook? Here are twelve healthy clean eating meal prep recipes for lunch or dinner! Start your clean eating weekly meal prep with this recipe for Rainbow Roasted Vegetables that you can chop and store ahead of time! This beautiful well-balanced recipe from Pinch of Yum uses only 5 ingredients and serves 8! Prepared with lean ground turkey and whole wheat breadcrumbs these meatballs from Eat Yourself Skinny are one of our favorite healthy clean eating meal prep recipes! The fact that they only take 30 minutes to make is a bonus! Keep your clean eating diet on track by meal prepping this easy lemon roasted salmon with sweet potatoes dish from Little Spice Jar. This healthy clean eating meal prep dish is super easy because the salmon, sweet potatoes, and broccolini (AKA: broccoli) all cook at the same temperature so you can pop it in the oven at the same time! Need low-carb Mexican dish? Here’s a fabulous make-ahead meal prep recipe from Kirbie’s Cravings to put in your keto or paleo rotation! This is the recipe that makes the other ones jealous! With jerk spiced chicken, black beans, sweet pineapple salsa, and Spanish rice, it will taste like you cooked for hours, but this dish comes together in 30 minutes! Perfect for meal planning beginners this sheet pan chicken and vegetables meal is simple and loaded with flavor! Four delicious lunches are on the other side of this yummy recipe from Sweet Peas & Saffron. This healthy clean eating meal prep recipe from Budget Bytes is bursting with flavor and works well on the grill too! Just in time for summer! Tired of taco night? Here’s an alternative with a healthy twist from Jar of Lemons! It takes only 30 minutes to put together this healthy clean eating meal prep recipe using kale, grape tomatoes, corn, black beans, and chicken! For an easy one pan vegetarian option chose this easy recipe from Simply Quinoa! One pan + 35 minutes = dinner or several tasty lunches! If you’re looking for gluten and dairy free healthy clean eating meal prep recipes here’s an easy and delicious one from Eat Yourself Skinny that’s full of flavor and filling too! Don’t over think meal planning and give up if your a beginner! Start small and work your way up! I hope these tips and healthy clean eating meal prep recipes help! Don’t forget to Save or Share these clean eating recipes on Pinterest! For more healthy recipes & tips, please follow my Clean Eating Recipes board!